SAN ANTONIO, TX – Valero Texas Open officials announced today a foursome of early player commitments from some of the top players on the PGA TOUR. Earlier, organizers announced player commitments from World No. 14 Rickie Fowler as well as past Valero Texas Open champions Andrew Landry (2018), Kevin Chappell (2017), Jimmy Walker (2015), Martin Laird (2013) and Brendan Steele (2011). 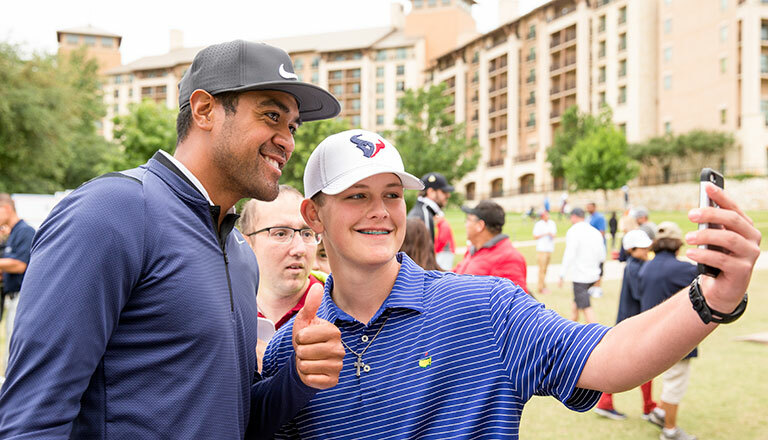 Tony Finau will be competing in the Valero Texas Open for the first time since finishing tied for third in the 2017 event. The 29-year-old performed well in 2018, finishing among the top ten 11 times, including the Masters, U.S. Open and Open Championship and was a captain’s pick for the U.S. Ryder Cup team. Finau, a 2016 TOUR winner, also finished second earlier this season at the WGC—HSBC Championship. Cameron Champ, who lives in San Antonio and practices at the TPC San Antonio facility, won the Sanderson Farms Championship earlier this season at the age of 23 and followed that victory with two more top ten finishes. The rookie sensation currently leads the TOUR in driving distance averaging 319.9 yards per drive, just ahead of Finau’s 318 yards per drive average. Abraham Ancer, also a San Antonio resident, is the highest ranked Mexican player in the world at the 58th spot and recently won the 2018 Emirates Australian Open. He has already recorded a pair of top ten finishes on TOUR after recording five during last season and finishing 60th on the FedExCup standings. Billy Horschel, ranked 38th in the world, is a five-time winner on TOUR and won the season-long FedExCup in 2014. He has twice finished third at the Valero Texas Open—in 2013 and 2015. GEORGE W. BUSH, 43RD PRESIDENT OF THE UNITED STATES: As part of its annual military appreciation platform, the Valero Texas Open will celebrate the 10th Anniversary of Night to Honor Our Heroes, which will feature special guest, George W. Bush, 43rd President of the United States. The gala event, which has become a cornerstone of the Valero Texas Open tournament week, will be held Friday, April 5, and will host more than 1,000 guests including members of our U.S. Armed Forces and other dignitaries as the tournament pays tribute to the men and women who serve and have served our country. To learn how you can be a part of this special evening, visit www.ValeroTexasOpen.com/nhoh/.